This excellent five part BBC documentary series is finally available on the definitive format, Blu-ray that takes the viewer on a truly otherworldly journey as we leave our humble planet and head to the stars... almost! 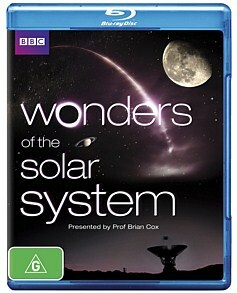 Presented by Professor Brian Cox, Wonders of the Solar System is not your average space documentary because Cox travels to exotic locations around the world in order to explain the mysteries of the stars but also how mankind and Earth have mirrored the stars. In the first episode "Empire of the Sun", Cox travels to India in order to explain to the viewer about our solar system's most precious object, the sun. Using a solar eclipse as his catalyst, the professor goes into some detail about the origin of the sun and how it has created life in our Solar System from the way it spreads it light, heat and energy to Earth and beyond. As he visits many countries around the world such as Ireland in order to help explain the mysteries of Saturn or to Alaska to talk about Saturn's moon Titan, his down to Earth approach and enthusiasm really has this magical effect on you and it's great how he uses our planet as a central reference point. Whether it's visiting Hawaii and its dormant volcano of Mauna Kea to discuss volcanoes on both Earth and other planets or to an episode entitled "Aliens" where he visits a cave in Mexico to see some of the harsh conditions that life exists on our planet and whether this could be replicated somewhere else such as Europa, one of the moons of Jupiter, is amazing to watch and does make you think. The 1080i/AVC-encoded transfer may not be as outstanding as some of the other BBC releases but it is still a visual treat, especially some of the cinematography of the real-world places on Earth. The CGI looks great, specifically when used to explain some solar system phenomena. Add in strong blacks, vibrant colours and sharp images, it's a very good transfer to Blu-ray for a TV made series. Audio supports DTS-HD 5.1 that supports good levels and has a very majestic soundtrack that helps with the storytelling of Cox. For a documentary, your surround sound system does get a mild workout at times, especially for some of the space segments. In the end, Wonders of the Solar System is an enjoyable yet informative series about linking the theories of space with our humble little planet called Earth.